Brassica oleracea, or wild cabbage, is a species of Brassica native to coastal southern and western Europe. Its tolerance of salt and lime, and its dislike of competition from other plants, restrict it to limestone sea cliffs, like the chalk cliffs on both sides of the English Channel. B. oleracea is believed to have been cultivated for several thousand years. It has been bred into a wide range of cultivars, including cabbage, broccoli, cauliflower, and more. Some of which are hardly recognisable as being members of the same genus, let alone species. Growing head of B. oleracea at Hooghly in West Bengal, India. All are in the same species. However, artificial selection has brought about genetic differences between the groups. In places such as the Channel Islands and Canary Islands where the frost is minimal, and plants can grow all year round, some cultivars can grow up to 3 meters tall. 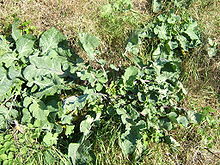 These "tree cabbages" yield fresh leaves throughout the year, and the plant is not destroyed as with a normal cabbage. Their woody stalks are sometimes dried and made into walking sticks. This page was last changed on 14 January 2019, at 06:04.